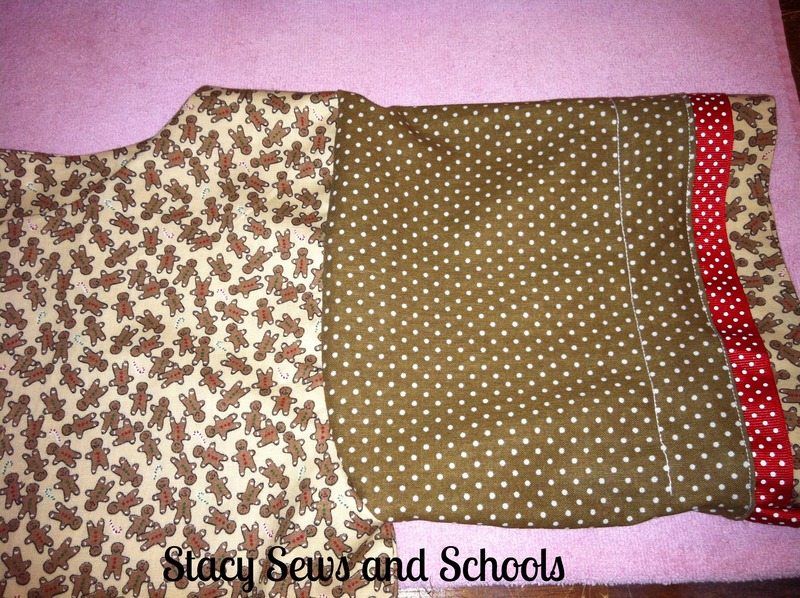 Fold over the fabric you want to use for the bodice of the dress. 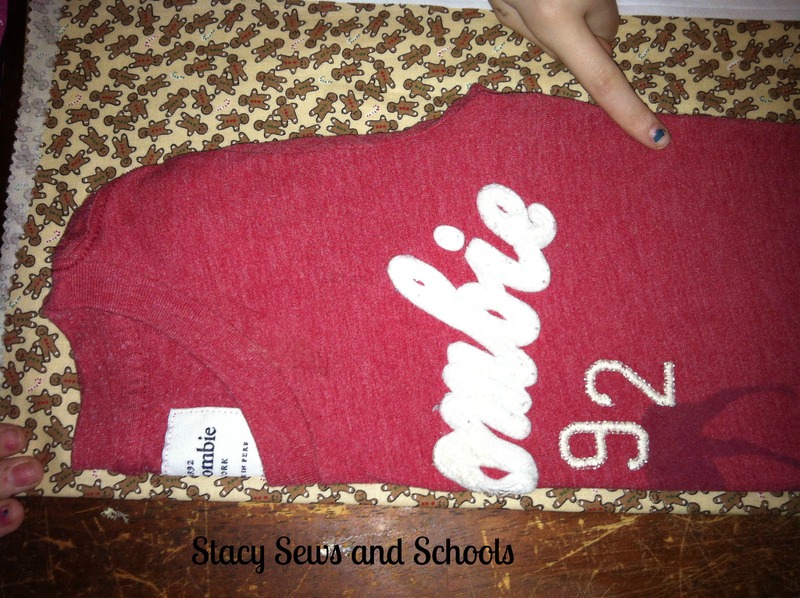 Place the folded shirt on top. 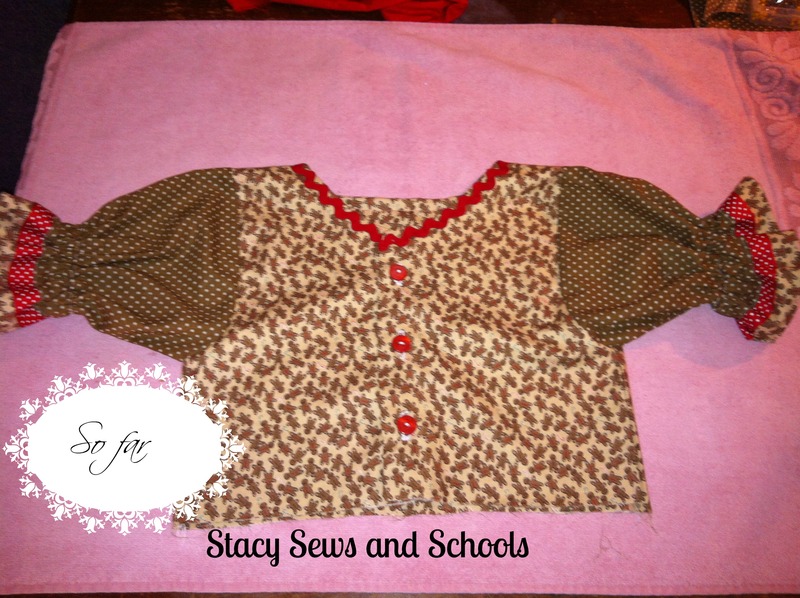 Cut around the shirt leaving excess all around for your seam allowance. You will cut one back and one front. This is what they should look like. 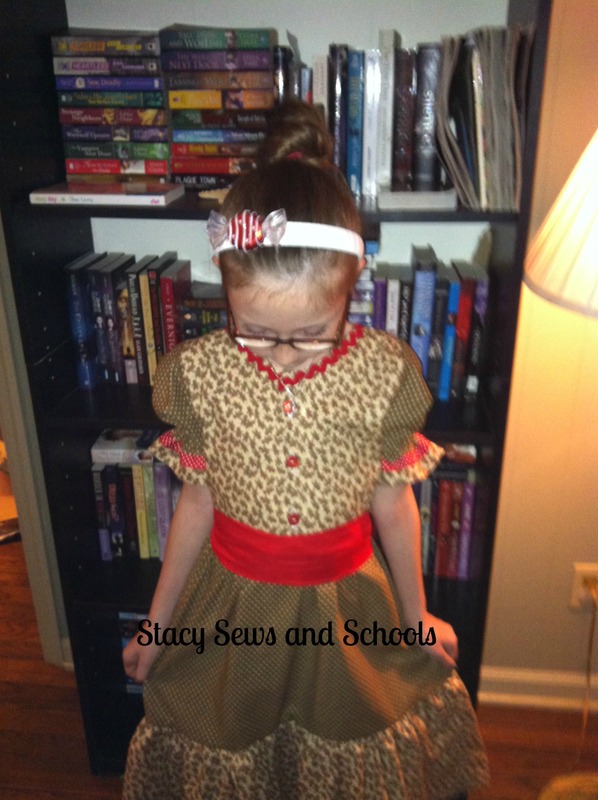 Now, take a straight edge and cut the front bodice piece right down the middle. 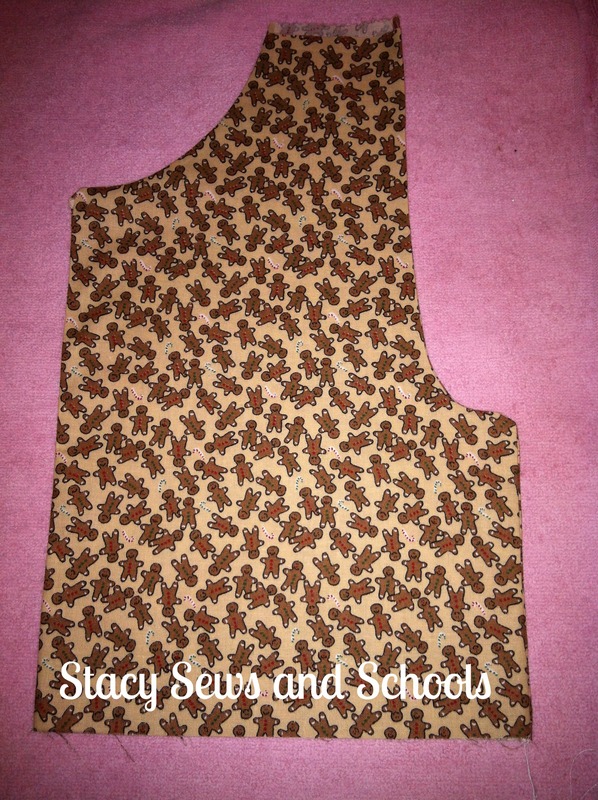 The bodice is fully lined so now you need to cut the lining using the bodice pieces you already have as a guide. 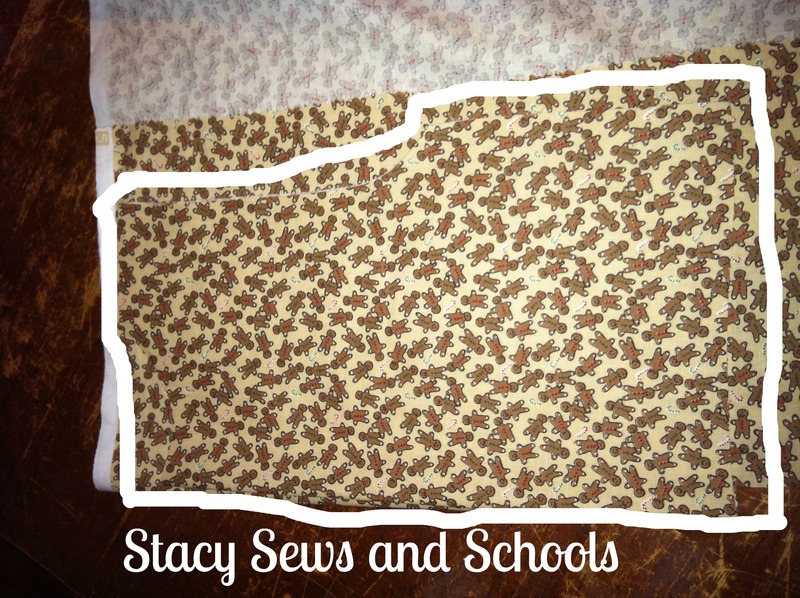 For the front bodice pieces it’s easier to just place them wrong sides together to cut. 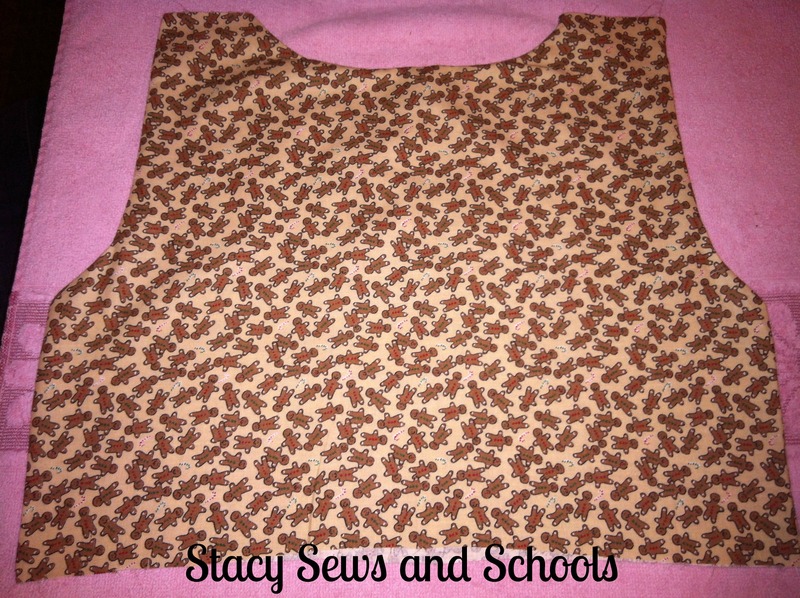 The back bodice piece can be placed on the fold. 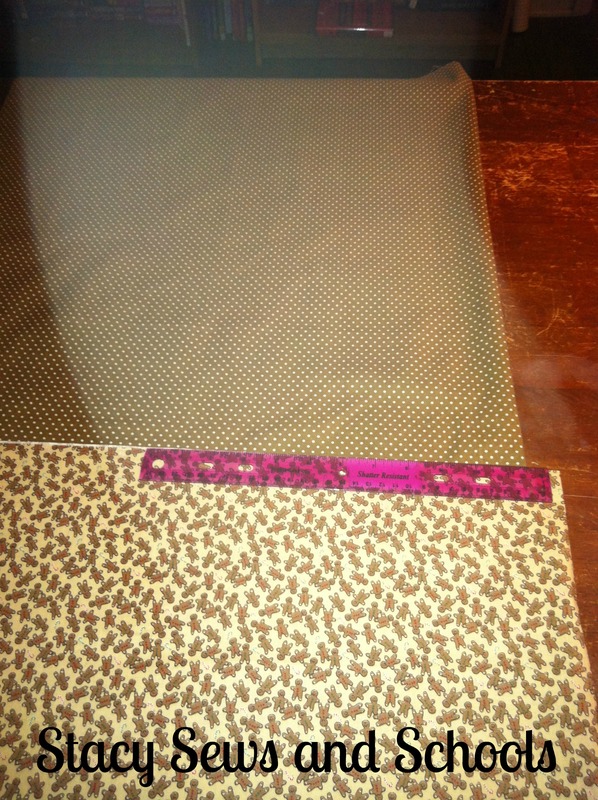 Now, we are going to cut the fabric for the bottom tier. 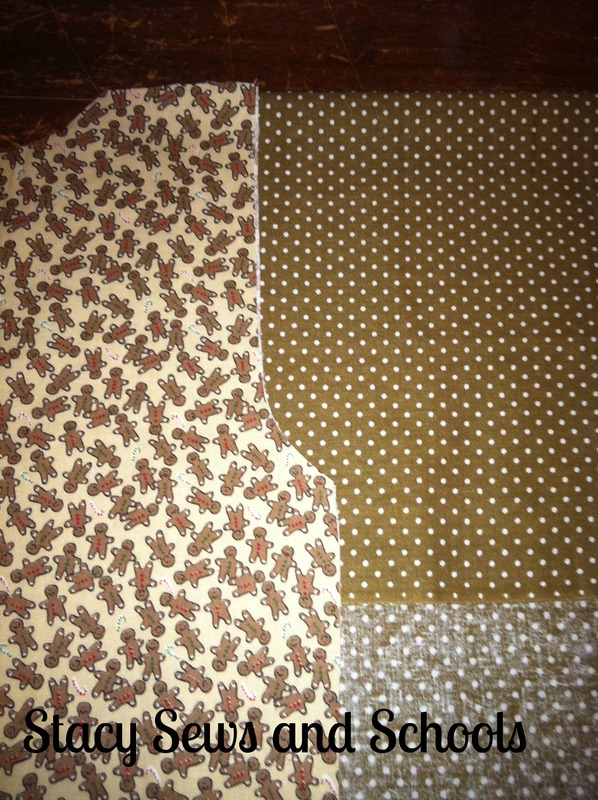 Just cut 2 even lengths of the same fabric you are using for the bodice. You can make it as wide as you want depending on the height of your child and how long you would like the dress to be. I made my cuts where the white lines are. 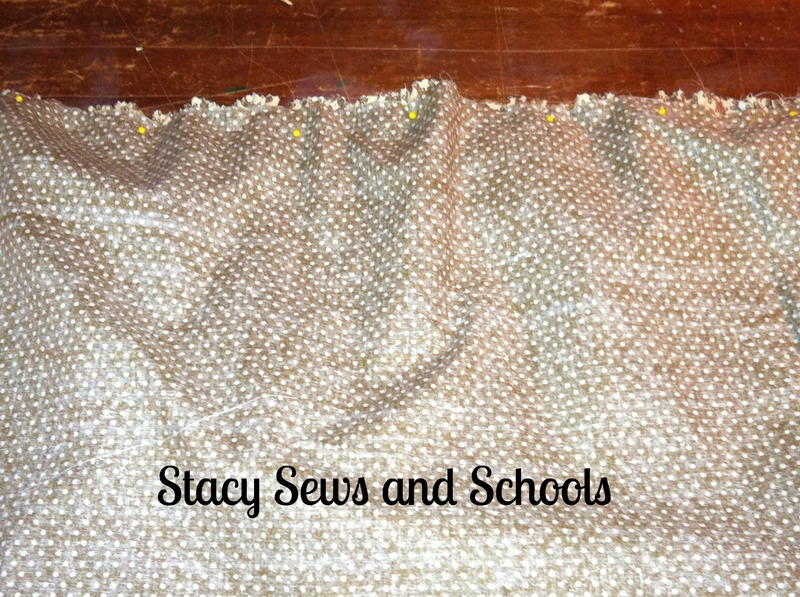 Now cut the top tier in your other fabric, making it the same width as the bottom tier. You will only need one piece for this tier. 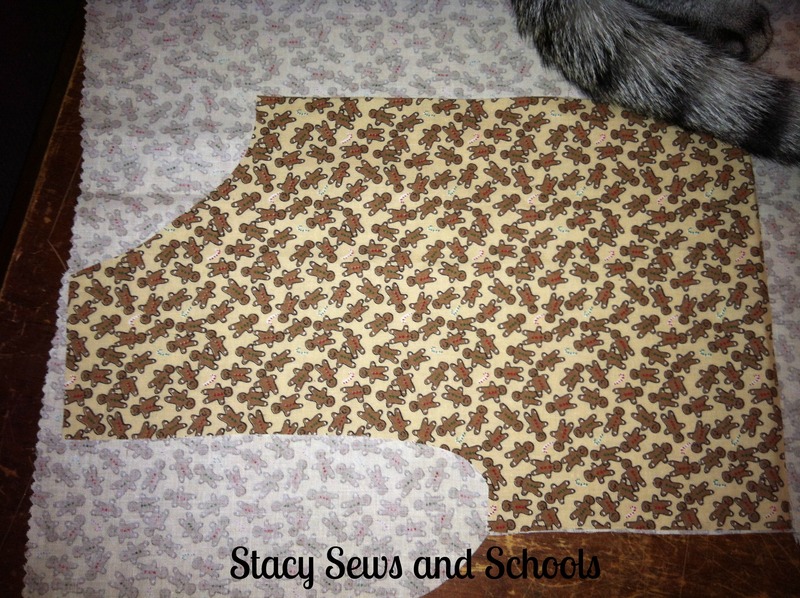 Using one of your bodice pieces as a guide, place your folded fabric under the guide and cut, leaving about 1/2 below the arm place on the bodice, and cut straight across. 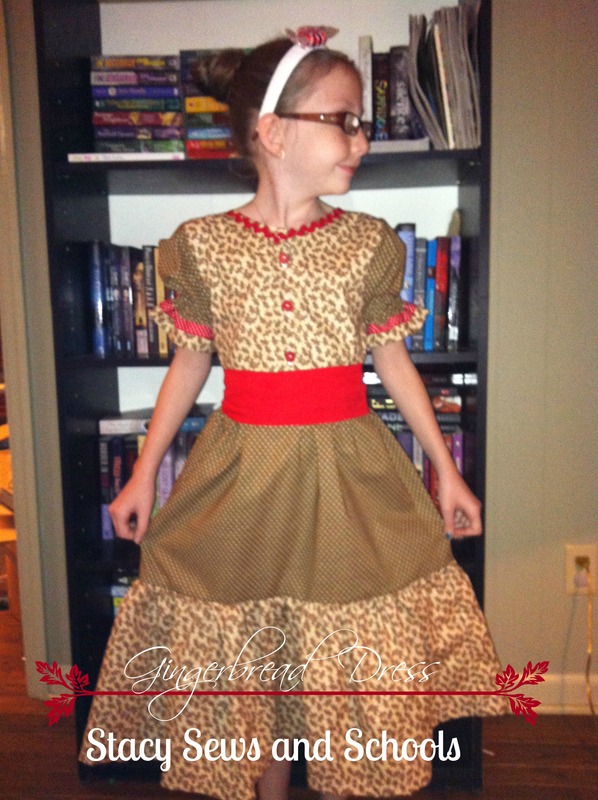 Now you are going to cut the piece that makes up part of the ruffle on the sleeve. 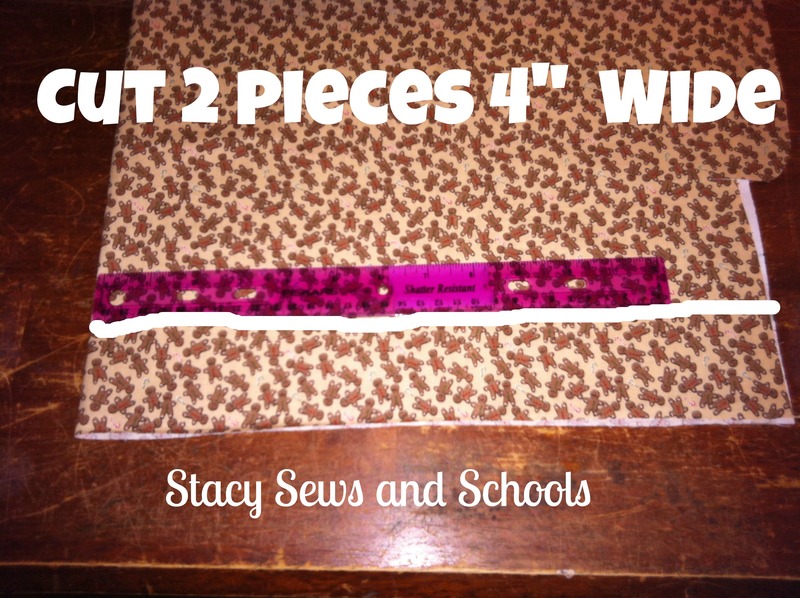 Cut 2 pieces that are 4 ” wide and the same length as your sleeve is round. 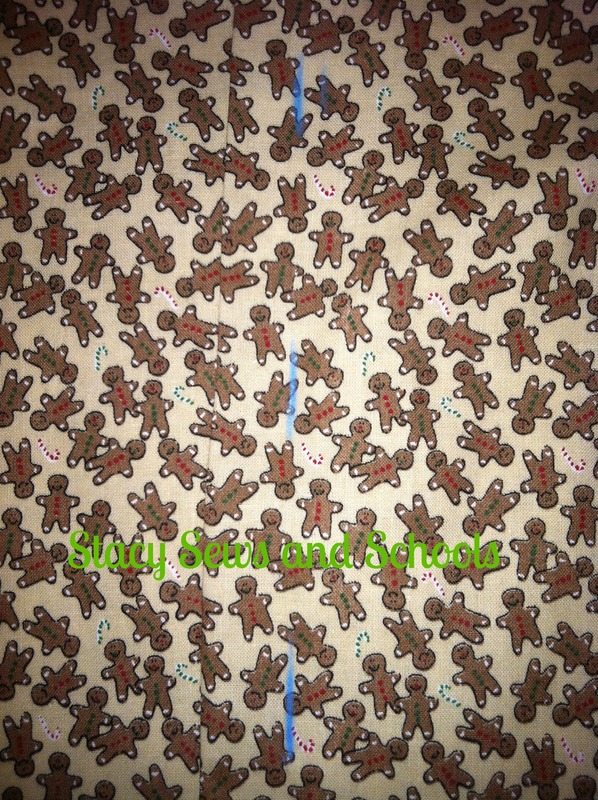 In other words ________________ this way needs to be the same as the sleeve is when it is unfolded. And 4″ this way . Make sense??? If not, just take a little peek at the picture at the top of the page and see how the sleeve is set up. I am having a bad case of fibro fog today. BLECK!!! 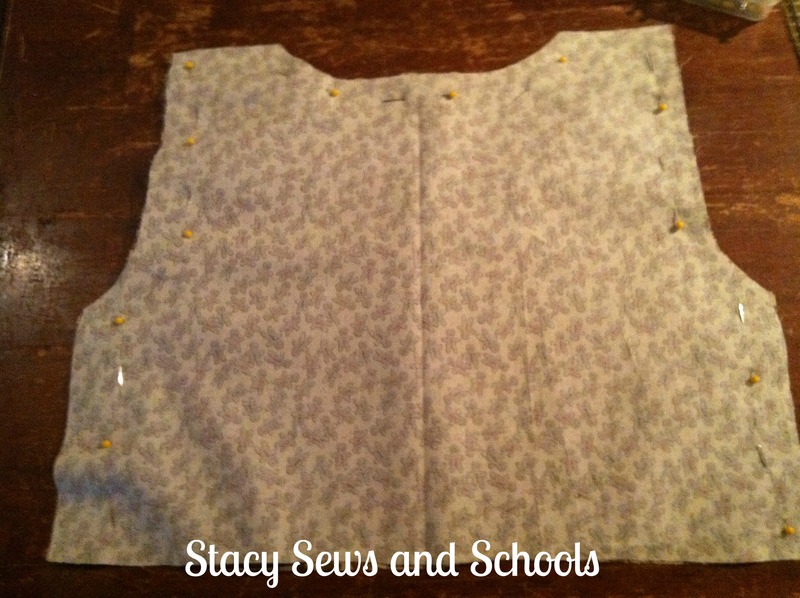 Pin your back bodice pieces with right sides together. 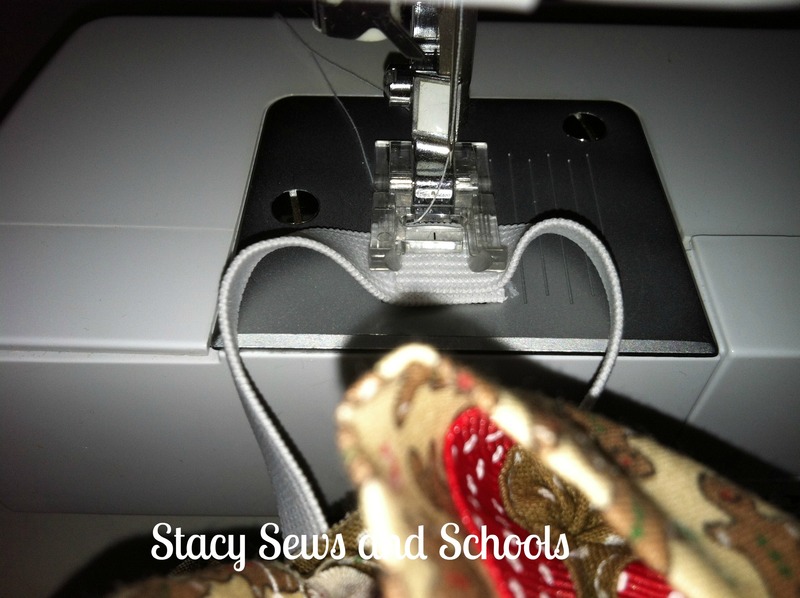 Sew up everything but the bottom. 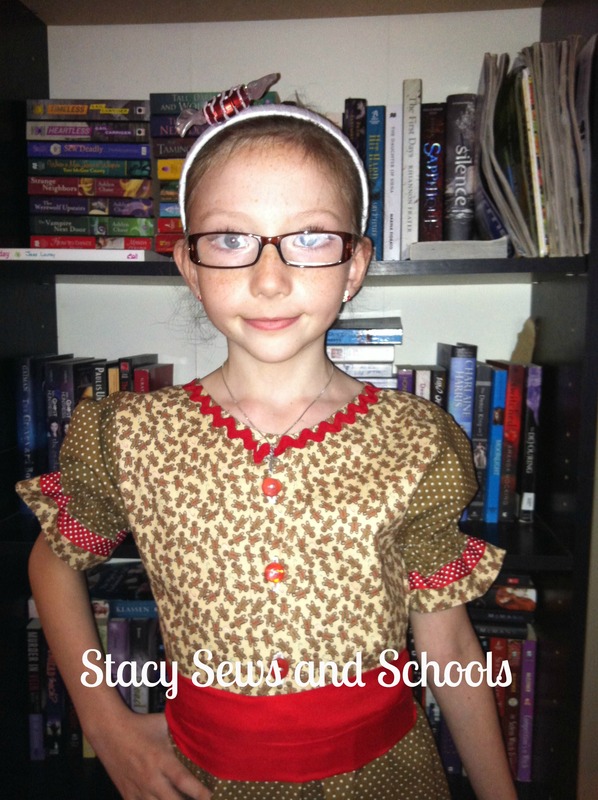 You can sew the shoulders if you want to. I didn’t with this one. Now, turn right side out and press! 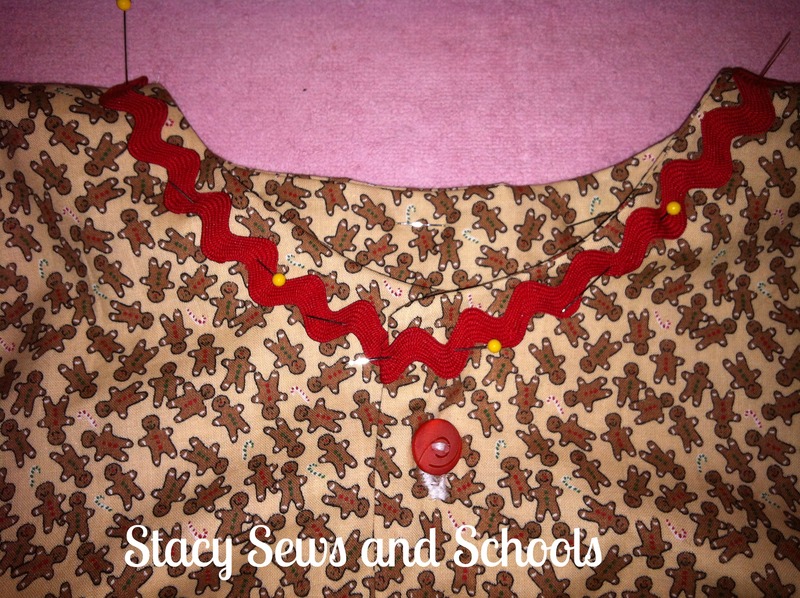 Pin your front bodice pieces with right sides together. 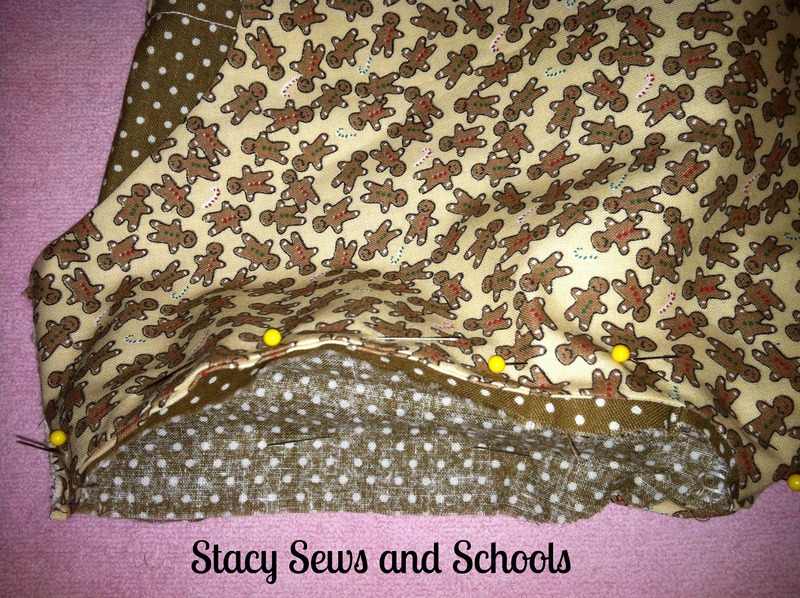 Sew everything together except the bottom. 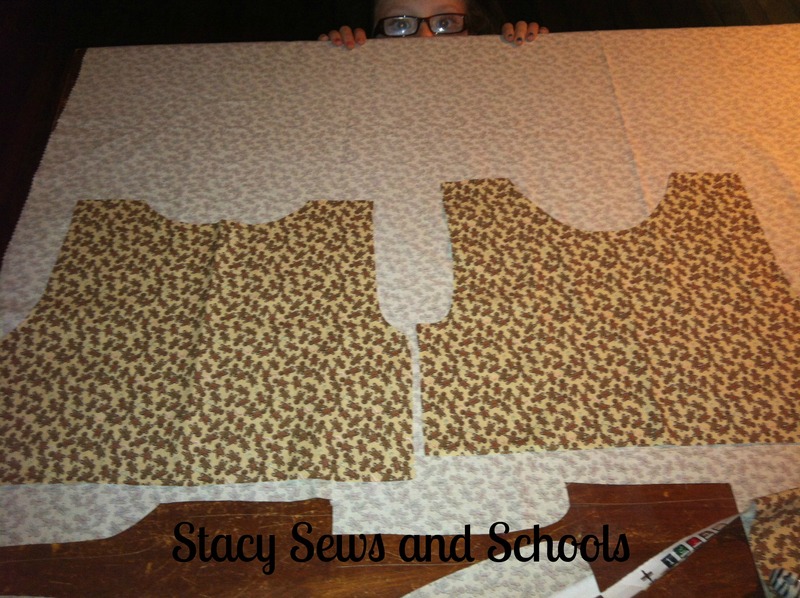 Do the same to the other 2 front bodice pieces. 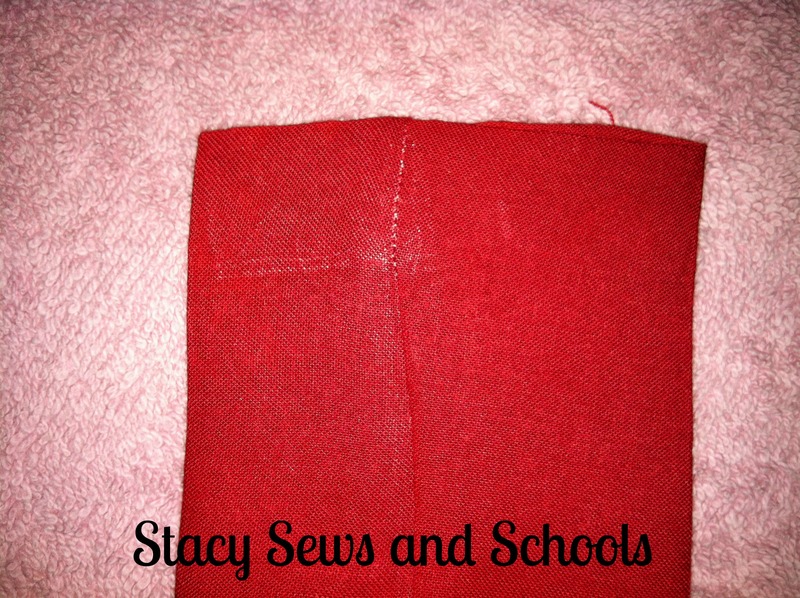 While your iron is still hot, go ahead and fold in half the long pieces for the sleeve edges and press. 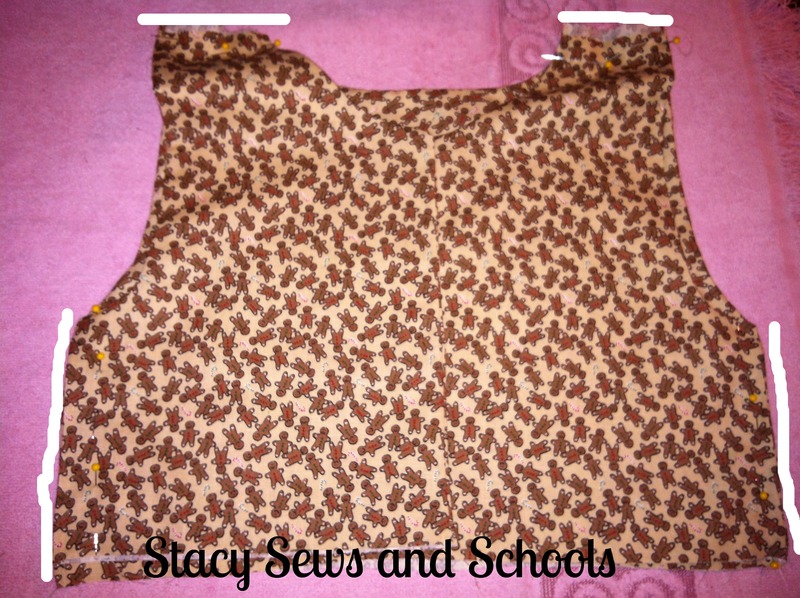 Now, sew your front bodice pieces to your back bodice pieces at the tops and the sides. Turn right side out and PRESS!! 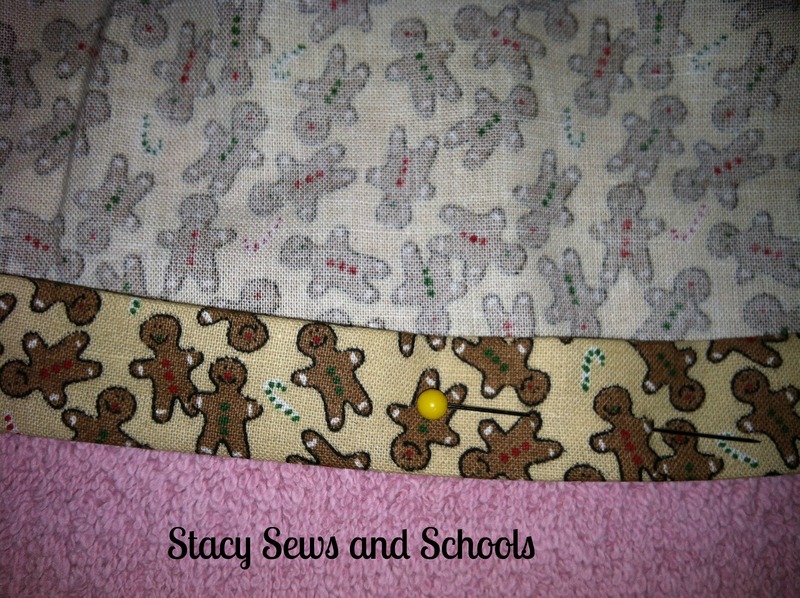 Time to sew up the sleeve! 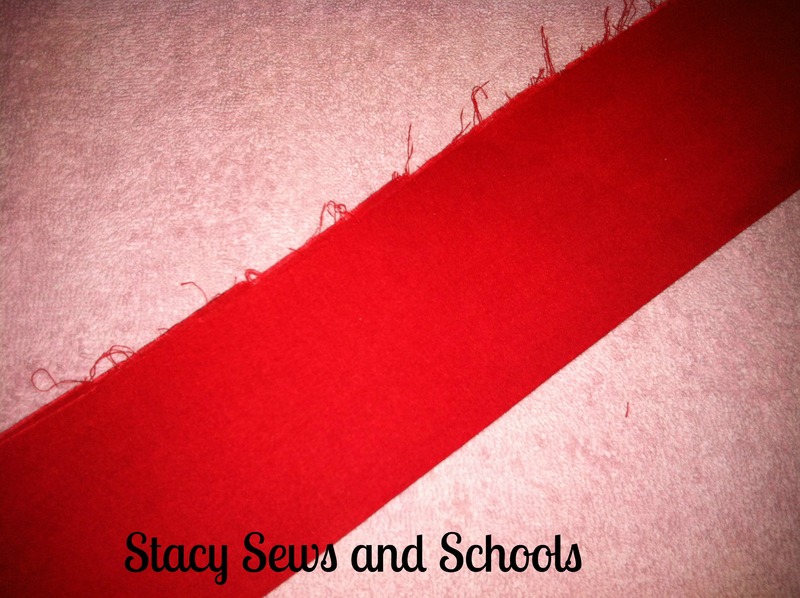 Take your ribbon and pin it to the edges of the fabric strips that you cut for the sleeve embellishment. 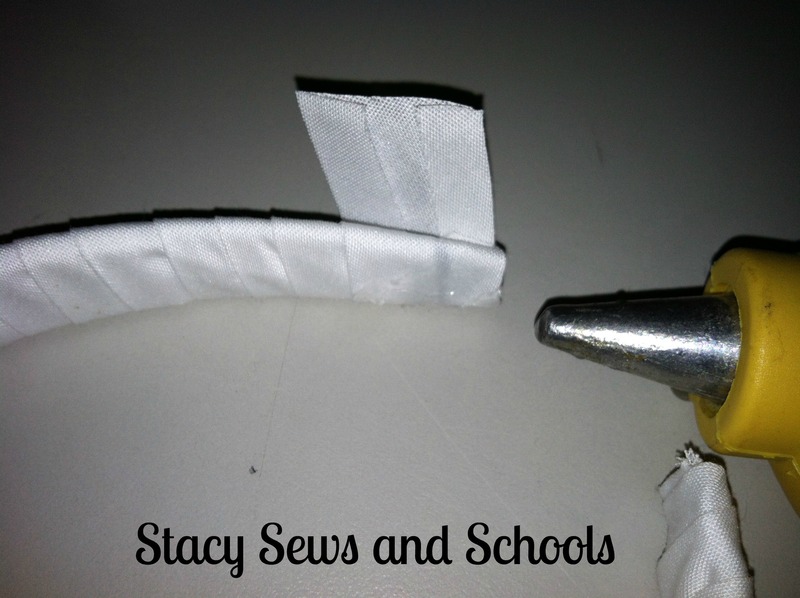 Turn the sleeve inside out and fold up the end 1 1/2″ and press. 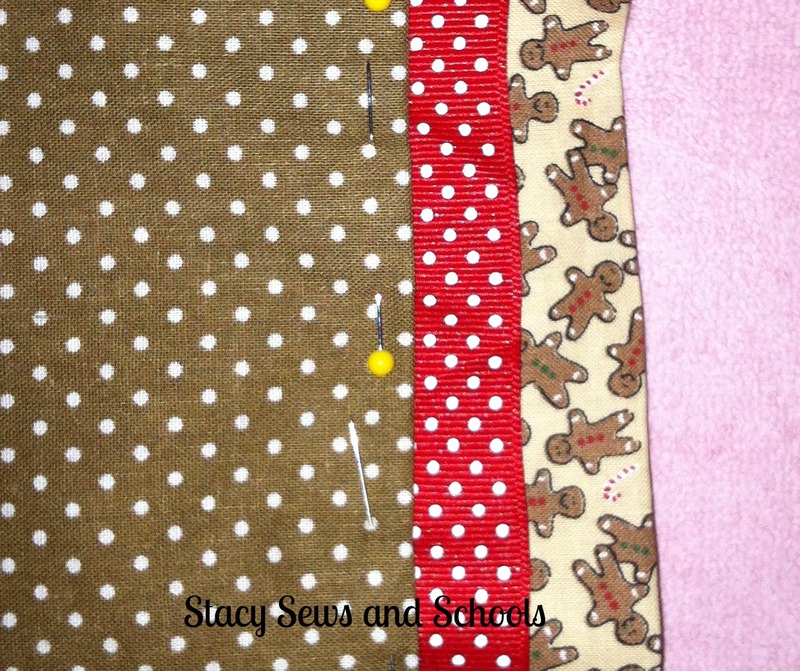 Turn the sleeve right side out and pin the ribbon and gingerbread strip inside of the edge of the sleeve. Sew in place. 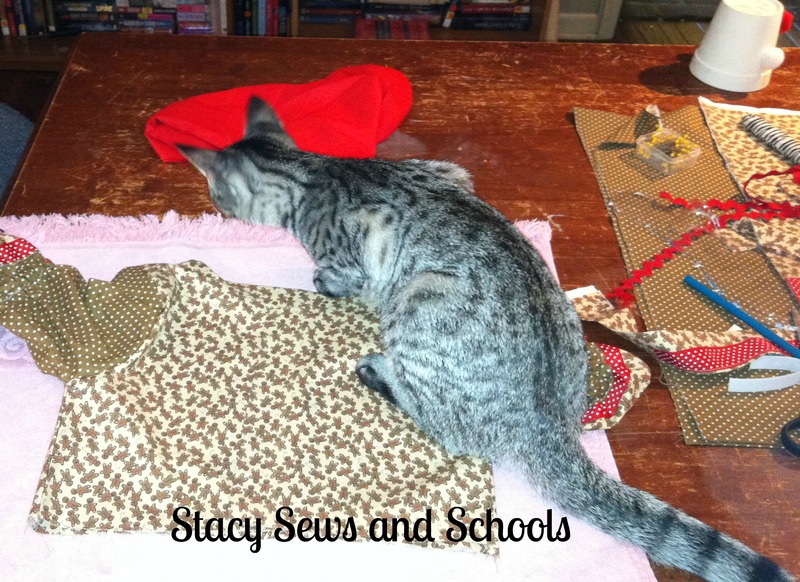 Turn your bodice inside out and slide the sleeve into the armhole, pin and stitch in place! Insert the elastic into the casing. Zigzag stitch the ends of the elastic. Remove the cat from your work space! SIGH……. 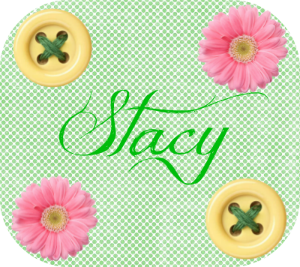 Time for the buttonholes! BLECK!! I can’t stand my buttonholer. It only works right about 10% of the time…. It did just ONE of the buttonholes on this piece. The other 2 I had to do myself. 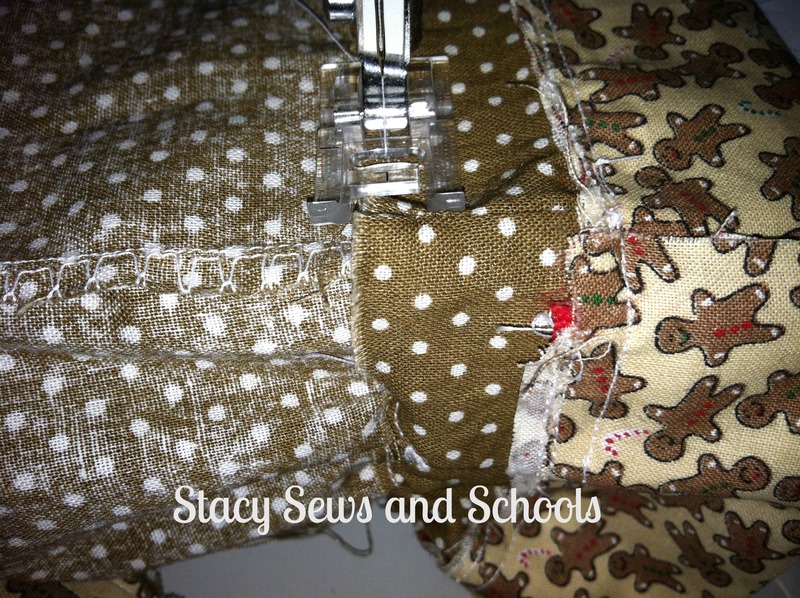 NOT fun but it can be done, just use the smallest zigzag stitch setting you can and a clear sewing foot helps tremendously! 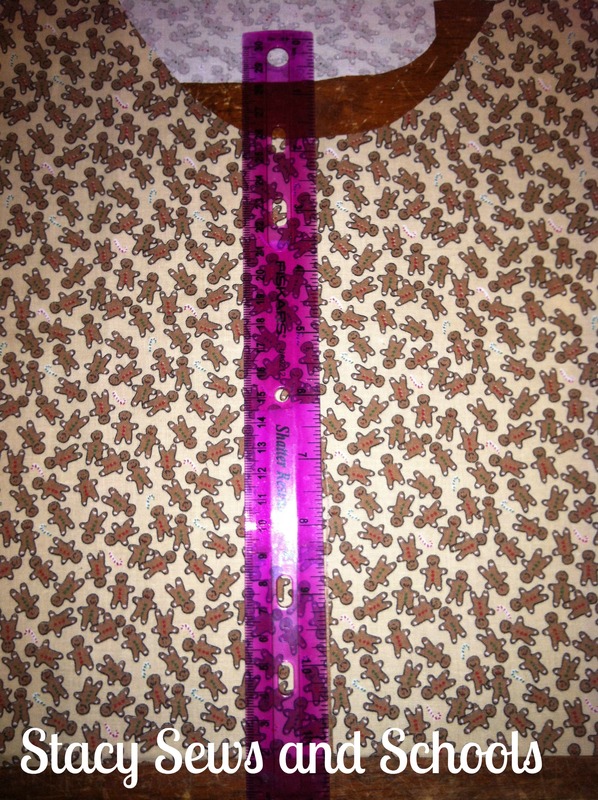 Anyway, take your ruler (if you can find it, I had to use something else….) and mark out where you want your buttonholes to be. 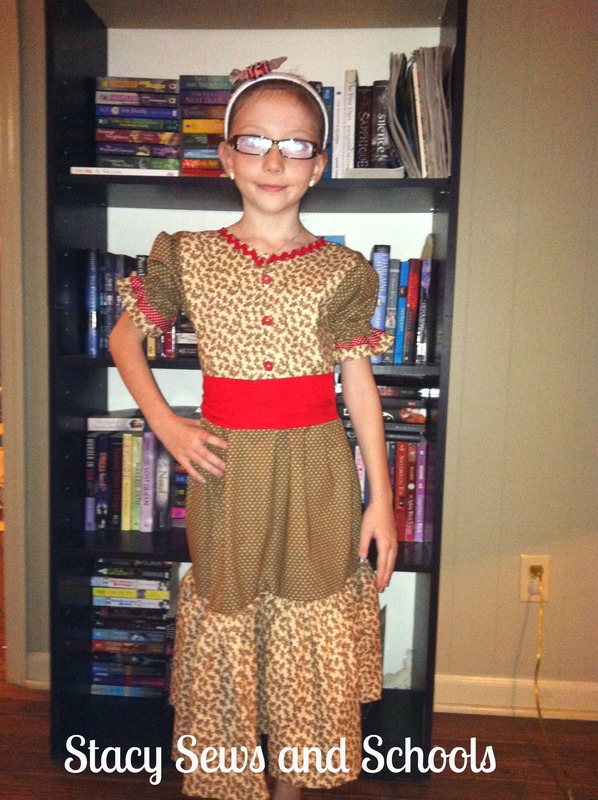 You can set aside the bodice for now! 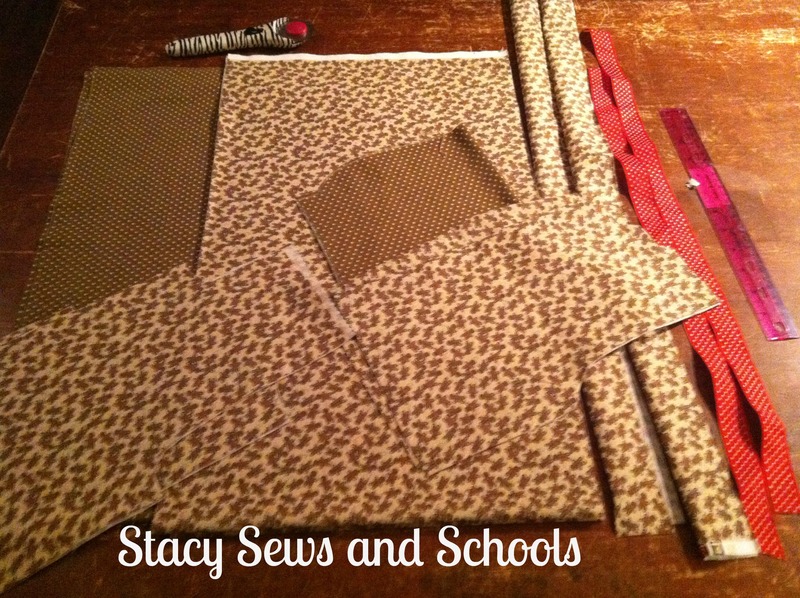 Now, grab the 2 pieces that you cut for the bottom tier and sew them together on one side. Next you need to run a line or two of gathering stitches at the top. 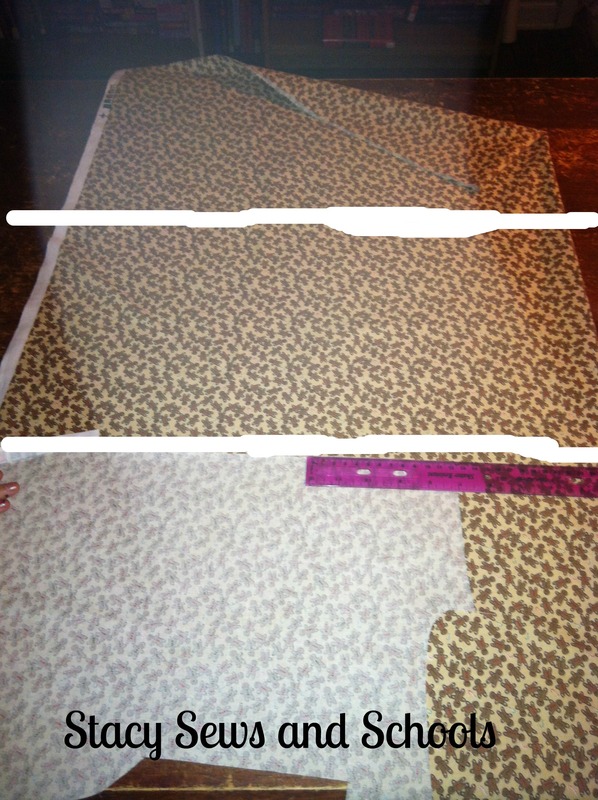 Now, gather it up and pin it to the bottom of the fabric you will be using for the top tier. 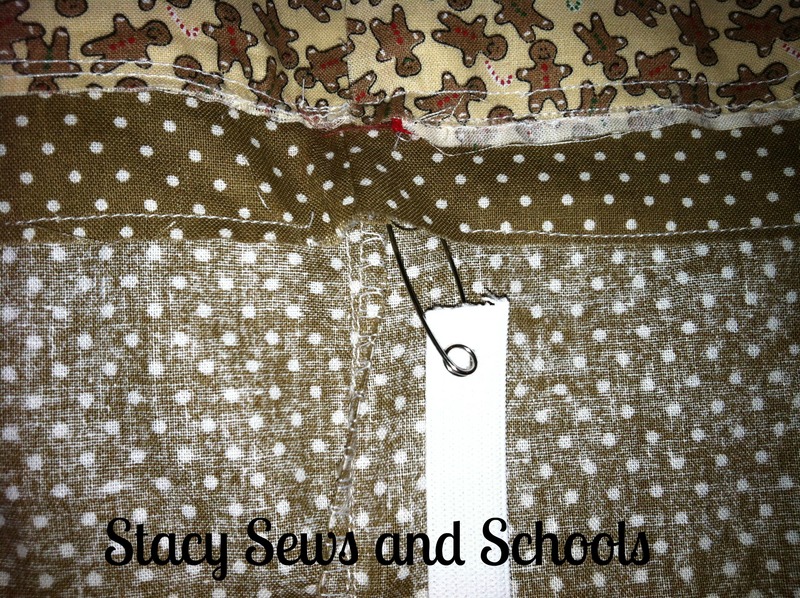 Pin it with right sides together and gathers to bottom, adjusting the gathers as needed. Now, run a line of gathering stitches in the top tier! 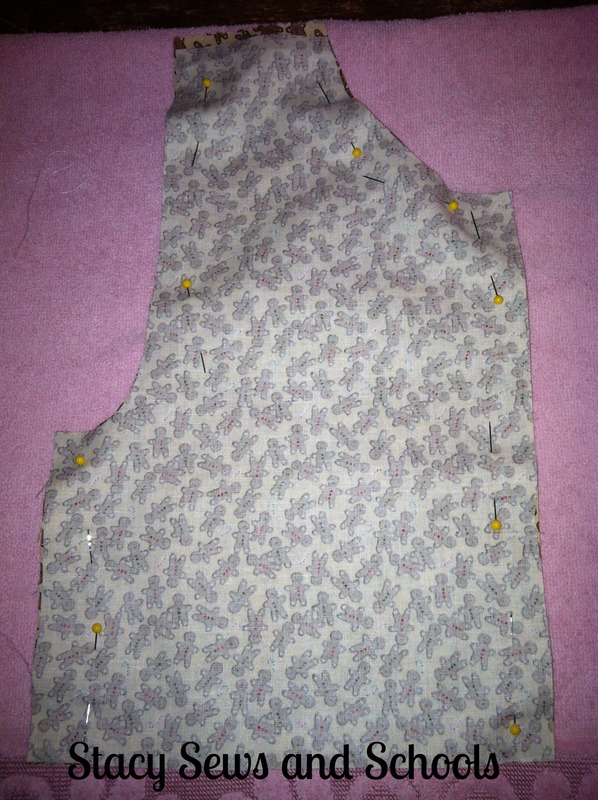 Next, pin the gathered edge to the bottom of the bodice, right sides together. 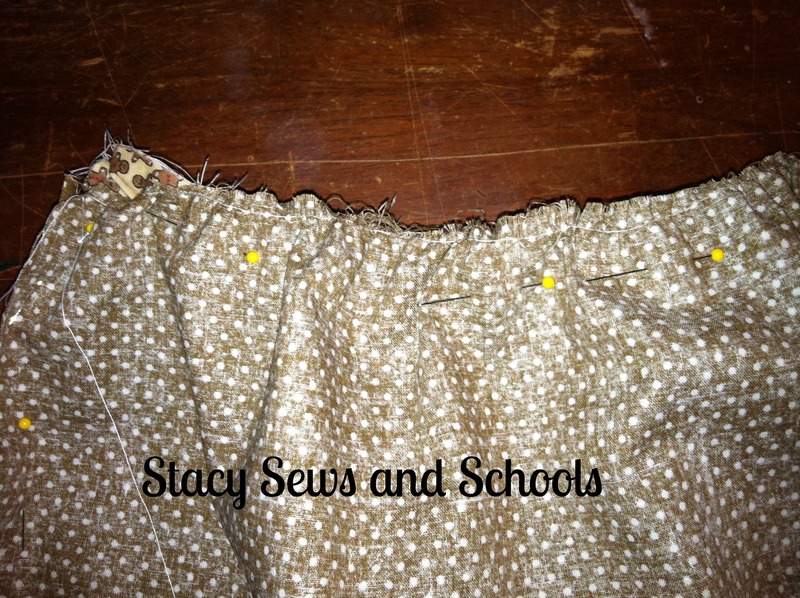 Fold up the bottom of the skirt 1/2″ and press, then fold up again 3/4″ , press and pin. 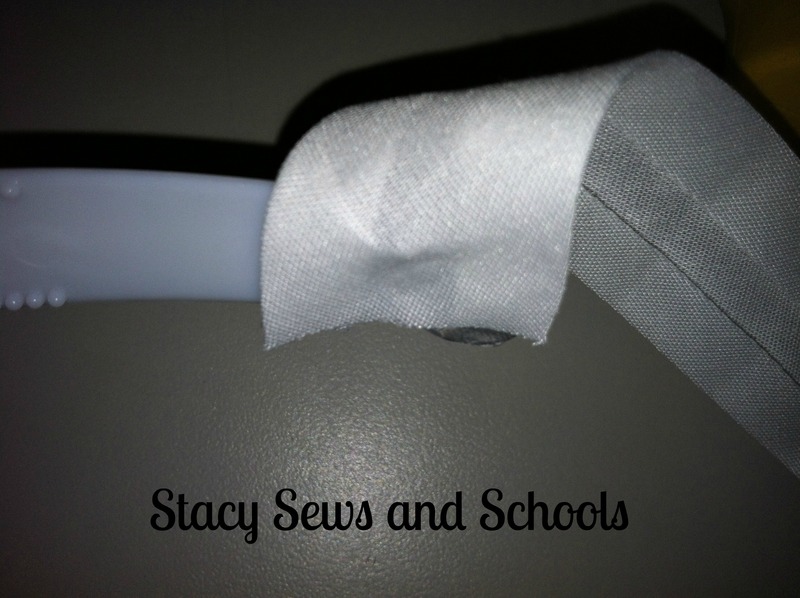 Now sew your hem! Time to cut the sash! 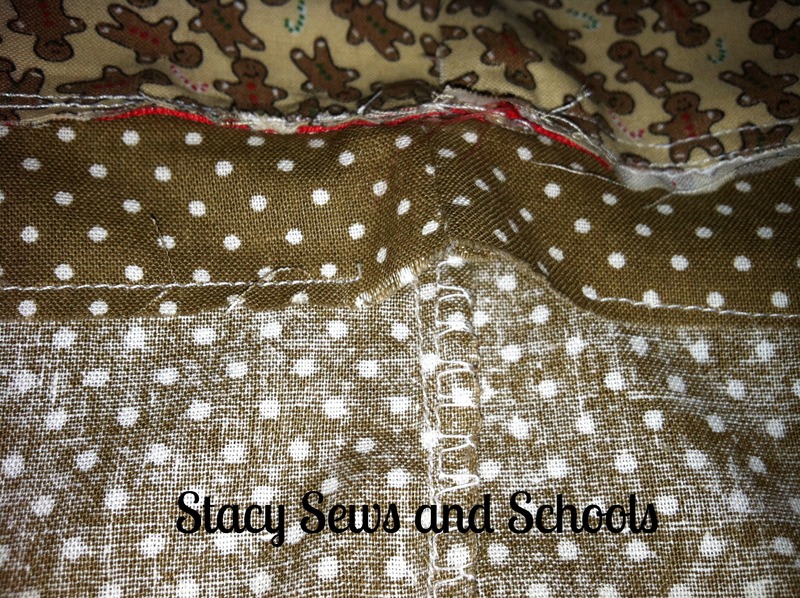 I cut from selvage to selvage for my length and 6″ for my width. Fold in half, press and pin. 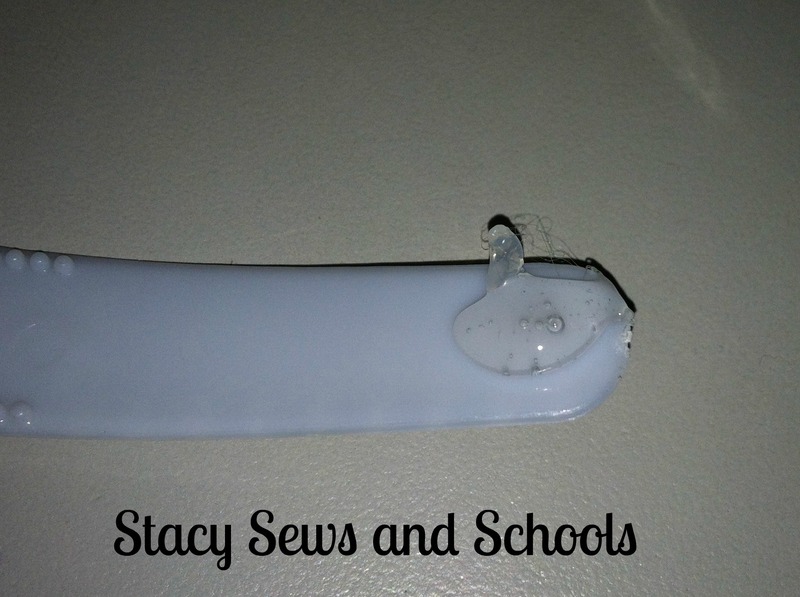 Now you are going to sew the raw edges together and make a long tube. Turn the tube right side out and press! 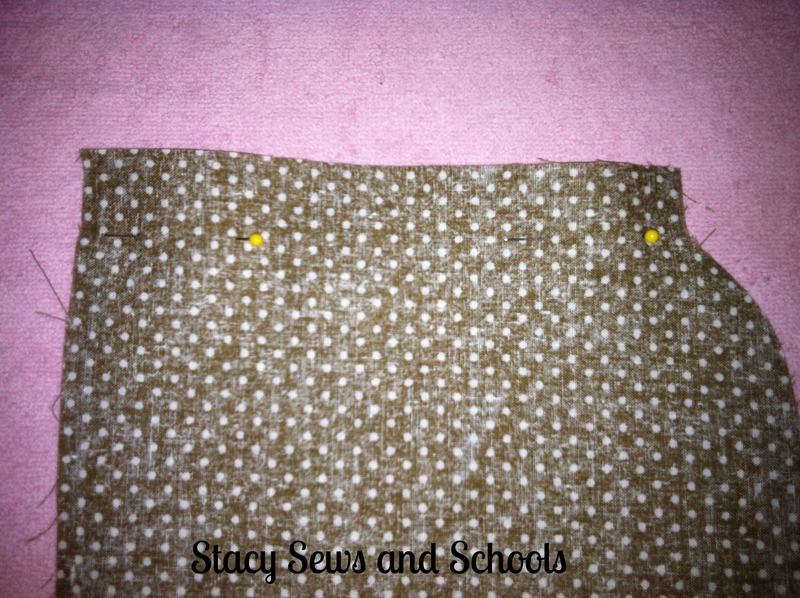 Turn the ends in by 1/2″ and press. 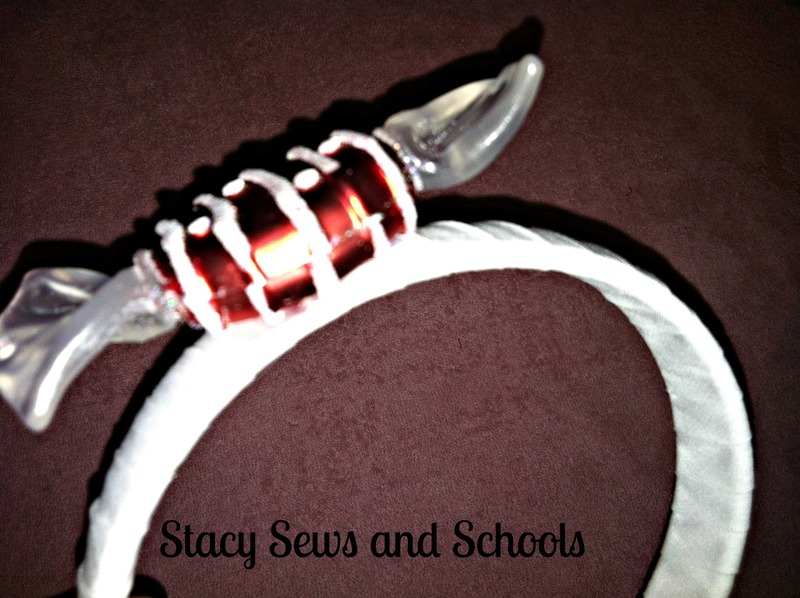 Put a glob of hot glue on the inside of the headband. 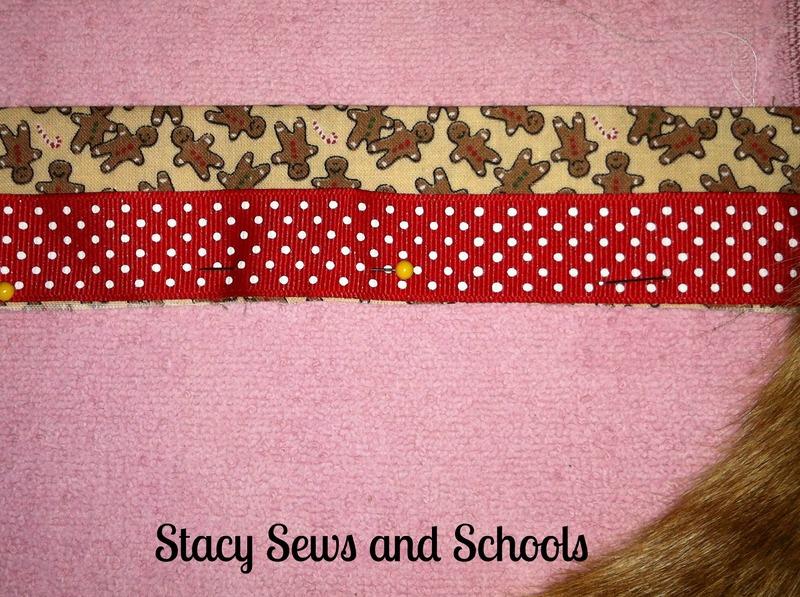 Now, stick the end of the bias tape/ribbon/whatever into the glue. 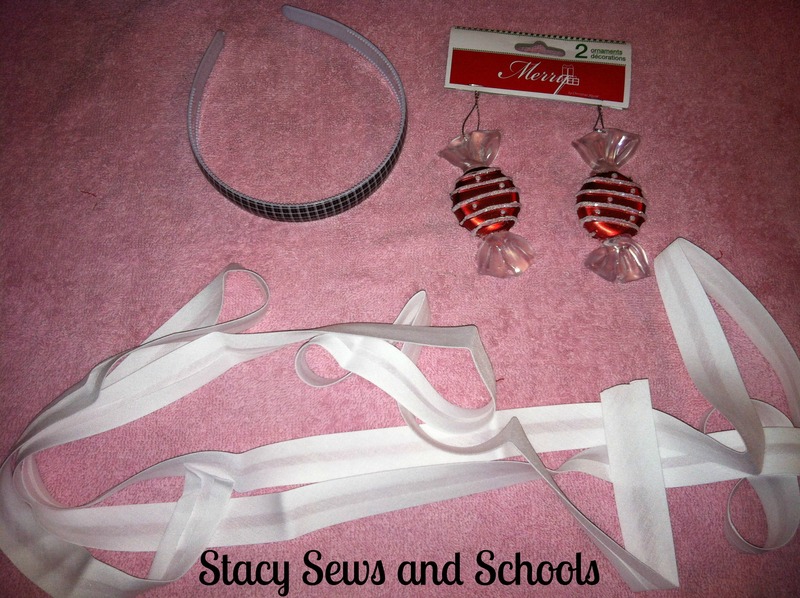 Just start wrapping the bias tape/ribbon/whatever all the way around the headband. 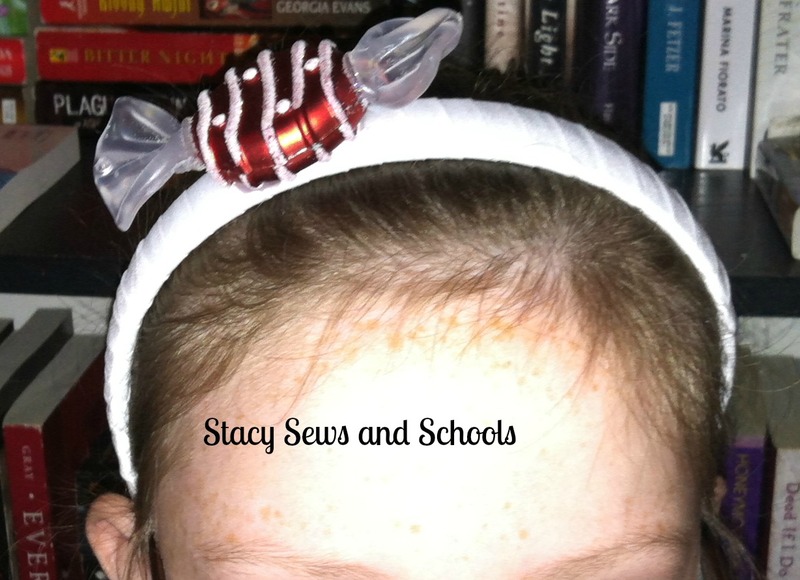 When you get to the end of the headband, put another glob of hot glue on the plastic of the head band. 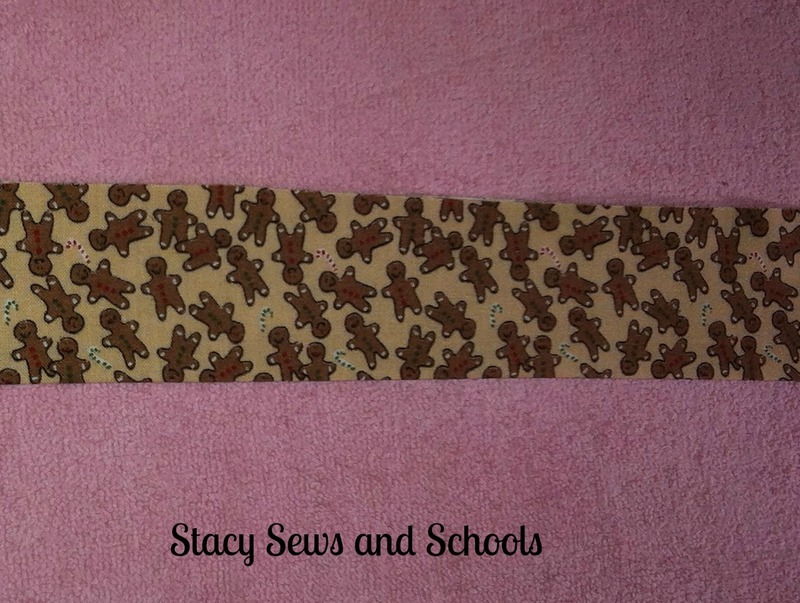 Then cut off the bias tape/ribbon/whatever and add another glob hot glue and smoosh the end of the bias tape/ribbon/whatever into it. Now put a ton of hot glue wherever you want to place your ornament and smoosh the ornament on.